Another tractor company Mercedes-Benz tractor company Actros 1848 LS Flat Floor arrives at its destination. Deliveries continue to be integrated into the vehicle fleet, consisting exclusively of owned vehicles in order to guarantee direct control over the quality of services. It is an imperative of Torello to focus on performing machines that can best harmonize needs driven by different reasons: excellent performance, customization for all types of transport and less impact on the environment. Mercedes-Benz is the partner that seems to balance out all the requirements that we expect to ensure the full operation of the fleet, consisting of over 2,500 trucks and refrigerators, all with high sustainable value, in compliance with the latest anti-emission regulations. Euro 6 vehicles cover 85.6% of the fleet; the Euro 5 9.4% and the lower grading vehicles, equipped with a particulate filter to limit emissions, correspond only to 5% of the fleet. A significant part of the vehicles is made up of tractors, semi-trailers and commercial vehicles for distribution – of which 10 hybrid vehicles that define a new type of service – in urban centres – are increasingly growing. In order to respond to the requirements of flexibility and customization, we are increasingly pushing ourselves towards solutions that offer the right combination of performance and comfort. A fleet that satisfies us precisely for its ability to combine our experience with Mercedes-Benz technology. 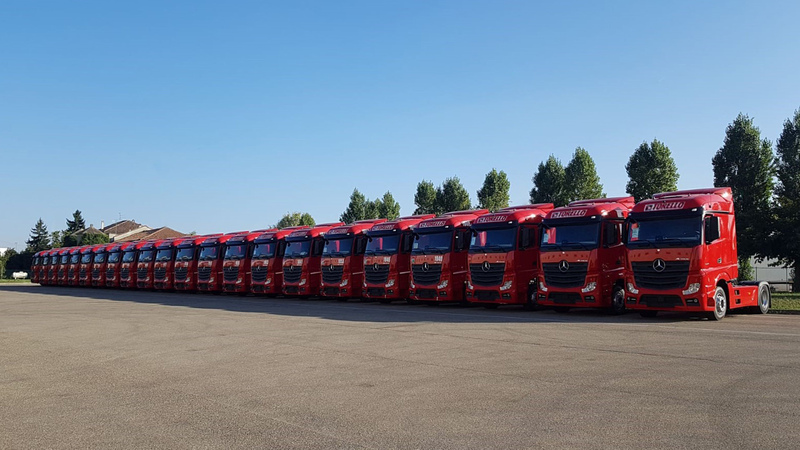 The operational needs of a company such as Torello are clear: the vehicles must never stop; the logistics machine must work 24/7 and having the latest equipment means that the whole company obtains better results in shorter times. The savings are not only in terms of kilometres travelled and therefore costs, but it is above all in terms of time and impact on the environment. Need more to offer more?